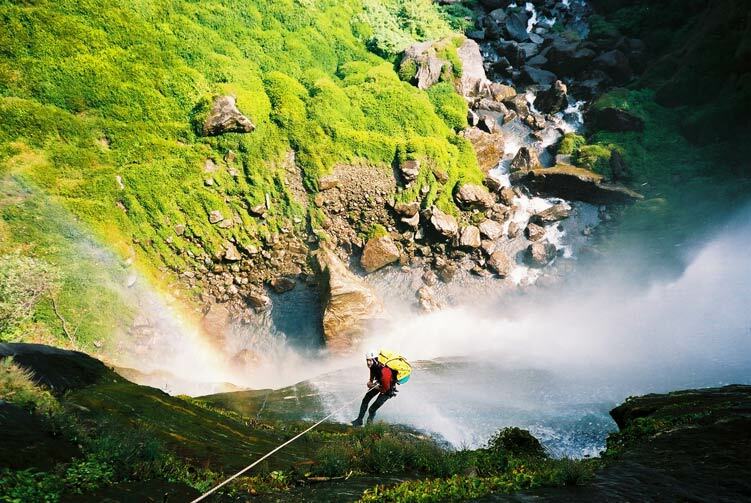 Best in World Class, Fell the Thrill at Sunkoshi Valley Canyoning. The Sunkoshi meaning The River of Gold is the biggest river of Nepal. The source of the river is the highest mountain on earth, Mt. Everest, and other mountains in the Himalayan Ranges; the river flows through the mid & eastern regions of Nepal. The canyoning site is just 72 km east of Kathmandu. Other interesting activities that can be included in the trip are rafting & shamanism tours. The BoldePhediche Village Development area is geographically diverse with an altitude that begins at 600m on the Sunkoshi riverbank and rises to around 2000m, the top of the Dorjegyang Hill. According to official government records, the village is 26 km from the Kavre District Headquarters of Dhulikhel and Dhulikhel is 29 km from Kathmandu. This village is a 6 hours hike away from the Arniko Highway which links Kathmandu with Tibet or 6 km from a seasonal road link to Koshidekha Village via Palanchok temple. The village is situated on the fascinating Timal Hill of Kavre District. The population of this area is 4500 people from 459 families. It is one of the most beautiful Tamang villages in Kavre district. There are two primary and two lower secondary schools as well as a well-equipped health centre. Tamang are a major ethnic hill tribe of Nepal. According to the village development committee's figures, in this area Tamang make up 85 percent of the population, Brahmin-10 percent, Newar-2.5 percent and others,-2.5 percent. This village is famous for the Buddha - chitaseed, used for making prayer bead garlands. These particular prayer beads are rare and cherished around the world. This entire village is rich in Tamang culture and tradition. Enjoy the friendly hospitality of the local people. While trekking in this area, we walk along spectacular ridges area of the Tamang-through their indigenous Buddhists community whose religion is a fusion of Buddhist Lamaism, Shamanism and Bon culture. It is common for each area to have a Lama and a Jhankri (Shaman). You will encounter different ethnic people and experience their socio-economic situation, life-style, and day to day activities. The area gives a wide range of exploration to all travelers. Few tourists have visited around this village up to now but the number of tourists is increasing. It offers a rich insight into the history, tradition, culture and religion, together with insight into the daily toil in the fields of its inhabitants. Itineraries can be tailored to your preferences from short to long and in-between. Trekking in Timal, you can experience genuine Tamang culture with unique customizetripoms, traditions and lifestyle. Day 01: Arrive in Kathmandu & Transfer to Hotel. Day 02: Half day Cultural tours around UNESCO world heritage sites/ Canyoning prepration, Overnight in Hotel. Day 03: Drive to Kallery Village, Overnight in Camp. Day 04: Canyoning in Bandiba Khola at Kallery, Overnight in Camp. Day 05: Canyoning in Tangtung Khola at Kallery, Overnight in Camp. Day 06: Free day and visit the Village, Kallery, Overnight in Camp. Day 07: Drive back to Kathmandu, Check in Hotel. Day 08: Rest day in Kathmandu, Overnight Hotel. Airport Pick and Drop in Kathmandu by Private vehicle. Welcome/Farewell dinner with cultural program as listed in the itinerary. Tourist Standard Hotel Accmmodiation in Kathmanduas listed in the Itinerary with B/B Basis. Standard Lodge/Guest House(best available) or in Tented Camp with twin sharing basis during the Canyoning Expedition. Private transportation to and from the starting and ending points of the tour. Full Board Meals (3 Meals a day) while on the Canyoning Expedition. Half Day Guided UNIESCO World Heritage Sites Tour in Kathmandu with entrance permit as listed in itinerary. 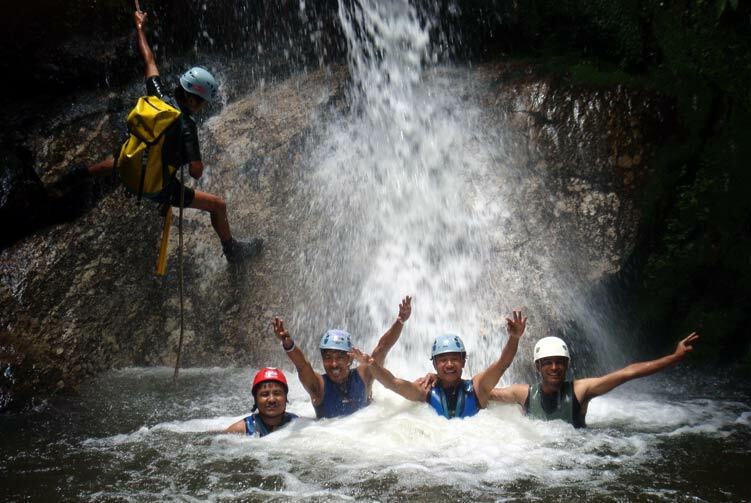 Professional & highly expertise government licensed holder English Speaking Tour and Canyoning Guide. All expenses of the Guide's and other staff that includes Food, Accommodation, Salary, Insurance, Equipment during your travel period. Tour Map, Friends Adventure Team's special Souvenir. All desserts, sweet things like chocolate, cake, pie, pudding. Clothing, Packing Items or Bags, Personal Medical Kit, Personal Trekking Gears. Medical and Travel Insurance and Emergency rescue by any means of Transportation including Helicopter evacuation if required. Nepal entry visa fee (Visa issuance is easy at the arrival). Hot shower and battery charging on the tea houses. Any other item not included in "Cost Includes" Section. The above tour Itinerary is a guideline and standard pattern. This tour can be modified according to your time and requirements. Cost & Departures Dates will change according to your NEED, GROUP SIZE and TIME. The tour Itinerary may be changed after understanding by both agency and client. Additional activities could be added or reduce as per client's request before confirming the trip. Price for reduced touring activities could be deducted and additional activities could be added as per mutual understanding. For these reasons the same tour can be HIGHER and LOWER Price. We offer you the best price guaranteed for Sunkoshi Valley Canyoning. Aww, There are no trip dates for this product! May be this product runs round the year, Please contact us for the schedule. Thank you. Canyoning can be dangerous. Escape out the sides of a canyon is often impossible, and completion of the descent is the only possibility. Due to the remoteness and inaccessibility of many canyons, rescue can be impossible for several hours or several days. Canyons with significant water flow may be treacherous and require special ropework techniques for safe travel. Hydraulics, undercurrents, and sieves (or strainers) occur in flowing canyons and can trap or pin and drown a canyoner. A potential danger of many canyoning trips is a flash flood. A canyon "flashes" when a large amount of precipitation falls in the drainage, and water levels in the canyon rise quickly as the runoff rushes down the canyon. In canyons that drain large areas, the rainfall could be many kilometers away from the canyoners, completely unbeknown to them. A calm or even dry canyon can quickly become a violent torrent due to a severe thunderstorm in the vicinity. Fatalities have occurred as a result of flash floods. Temperature related illnesses are also canyoning hazards. In arid desert canyons, heat exhaustion can occur if proper hydration levels are not maintained and adequate steps are not taken to avoid the intense rays of the sun. Hypothermia can be a serious danger in any canyon that contains water, during any time of the year. and can mitigate this danger to a large degree, but when people miscalculate the amount of water protection they will need, dangerous and sometimes fatal situations can occur. Some canyoneering, especially in sandstone slots, involves escaping from large potholes. Also called "keeper potholes," these features, carved out by falling water at the bottom of a drop in the watercourse, are circular pits that often contain water that is too deep to stand up in and whose walls are too smooth to easily climb out of. Canyoneers use several unique and creative devices to escape potholes, including hooks used for aid climbing attached to long poles and specialized weighted bags that are attached to ropes and tossed over the lip of a pothole. Narrow slot canyons, especially those narrower than humans, present difficult obstacles for canyoners. At times a canyoner is forced to climb up (using chimneying or off-width climbing techniques) to a height where one can comfortably maneuver laterally with pressure on both walls of the canyon. This tends to be strenuous and can require climbing high above the canyon floor, unprotected, for long periods of time. Failure to complete the required moves could result in being trapped in a canyon where rescue is extremely difficult. Narrow sandstone slot canyons tend to have abrasive walls which act as sandpaper as a canyoner moves or slides along them. This abrasion tends to rip clothing and gear, and can cause painful skin abrasion. A proper VISA to enter and stay in Nepal is a must. There are reported cases when travelers are advised non-requirement of Nepal VISA by their travel agents. Practically every foreign national requires VISA to enter these countries. Do not encourage beggars. Don't trust strangers with money. Trust your hotel, but not people you may bump into on the streets. It is advisable to cover yourself with travel insurance for thefts, loss and medi-claim. Carry proper maps of the places proposed to visit in Nepal, as signboards are often absent. Try to reach a station during daytime if traveling on your own. In any case avoid persistent touts and taxi-drivers at airport/stations/bus stand to help you find your hotel. Always use tourist assistance desk for proper advice. Women traveling alone in certain deserted places should avoid walking at odd hours. While changing money, insist on getting encashment certificate. Do not checkout of the hotel in hurry. While checking out it has been noticed in some hotels, the extras are unreasonably charged which the guest hurriedly pays without cross-checking. Do not leave your cash and valuables in your hotel rooms. Keep your cash divided in different pockets. Take care of proper disposal of your rubbish always whether you are exploring Cities, Himalayas or anywhere else. Always use strong suitcases/baggage, as mishandling is common at airports/stations. Don't tip unreasonably and unnecessarily in a hotel. The NEWS soon spreads in the hotel and by the time you checkout there will be a group of them saluting you to expect something. Most of the monuments give very good discount for students from all over the world. They must carry there valid school identity card.